Text: Jerome's prologue to Judith; Judith 1:1-2:16 (recto) and 2:16-5:3 (verso). The translation of the prologue is by Ed Gallagher. Reconstruction Note! 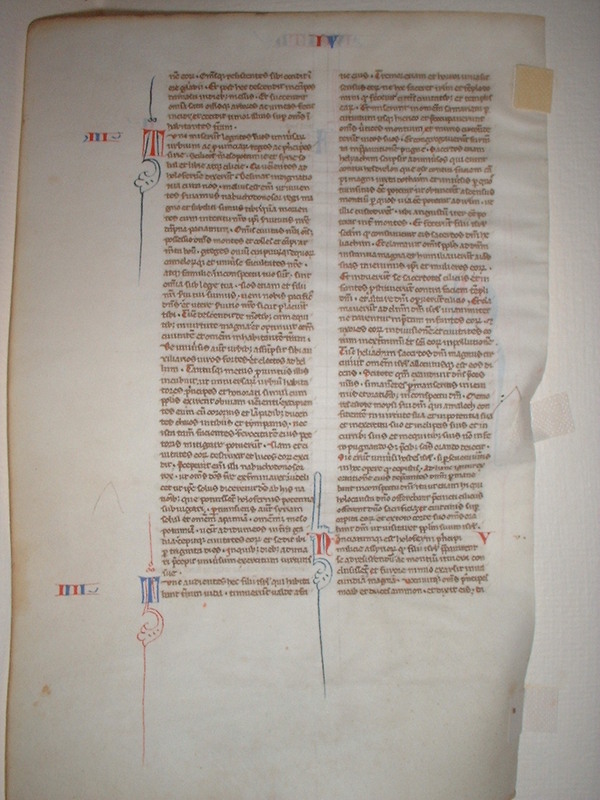 In Ege's original manuscript, this leaf was followed by what is now Leaf 11 in the University of Colorado, Boulder portfolio. Together they contain Jerome's prologue and Judith 1:1-10:1.
idonea iudicatur. Chaldeo tamen sermone conscriptus inter historias conputatur. 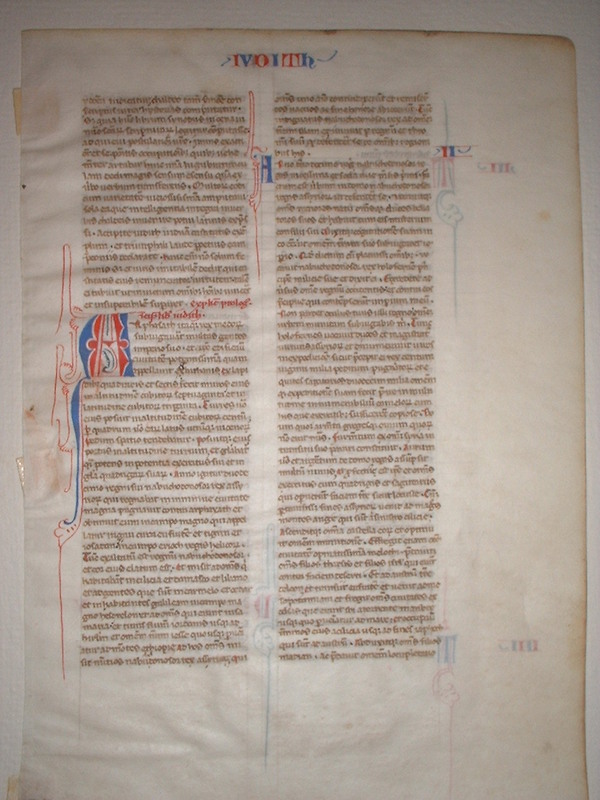 Sed quia hunc librum sinodus nicena in numero Sanctarum Scripturarum legitur conputasse, adquievi postulationi vestrae, immo exactioni, et sepositis occupationibus quibus vehementer artabar, huic unam lucubratiunculam dedi, magis sensum e sensu quam ex verbo verbum transferens. Multorum codicum varietatem vitiosissiraam amputavi; sola ea quae intellegentia integra in verbis chaldeis invenire potui, latinis expressi. Accipite Iudith viduam, castitatis exemplum, et triumphali laude perpetuis eam praeconiis declarate. Hanc enim non solum feminis, sed et viris imitabilem dedit, qui, castitatis eius remunerator, virtutem talem tribuit, ut invictum omnibus hominibus vinceret, insuperabilem superaret. Explicit prologus. Incipit liber Iudith. ...that come into contention. Nevertheless, having been written in Chaldean speech, it is reckoned among the histories. But because the Nicene Synod is read to have reckoned this book in the number of holy Scriptures, I have assented to your request, nay, demand, and having set aside occupations by which I was being violently squeezed, I have given to this one a single night, translating sense for sense rather than word for word. I have eradicated the terrible variety of the many codices; only that which I could find in Chaldean words with complete comprehension did I express in Latin words. Take up the widow Judith, an example of chastity, and with perpetual proclamations acclaim her in triumphal praise. For he has given her as a model not only to women, but also to men, and he, the rewarder of her chastity, has provided such power that she overcame the one not overcome by anyone, and conquered the unconquerable. Here ends the prologue. Here begins the book of Judith. 1 Now Arphaxad king of the Medes had brought many nations under his dominions, and he built a very strong city, which he called Ecbatana, 2 Of stones squared and hewed: he made the walls thereof seventy cubits broad, and thirty cubits high, and the towers thereof he made a hundred cubits high. But on the square of them, each side was extended the space of twenty feet. 3 And he made the gates thereof according to the height of the towers: 4 And he gloried as a mighty one in the force of his army and in the glory of his chariots. 5 Now in the twelfth year of his reign, Nabuchodonosor king of the Assyrians, who reigned in Ninive the great city, fought against Arphaxad and overcame him, 6 In the great plain which is called Ragua, about the Euphrates, and the Tigris, and the Jadason, in the plain of Erioch the king of the Elicians. 7 Then was the kingdom of Nabuchodonosor exalted, and his heart was elevated: and he sent to all that dwelt in Cilicia and Damascus, and Libanus, 8 And to the nations that are in Carmelus, and Cedar, and to the inhabitants of Galilee in the great plain of Asdrelon, 9 And to all that were in Samaria, and beyond the river Jordan even to Jerusalem, and all the land of Jesse till you come to the borders of Ethiopia. 10 To all these Nabuchodonosor king of the Assyrians, sent messengers: 11 But they all with one mind refused, and sent them back empty, and rejected them without honour. 12 Then king Nabuchodonosor being angry against all that land, swore by his throne and kingdom that he would revenge himself of all those countries. ...and all that resisted him he slew with the edge of the sword. 17 And after these things he went down into the plains of Damascus in the days of the harvest, and he set all the corn on fire, and he caused all the trees and vineyards to be cut down. 18 And the fear of them fell upon all the inhabitants of the land. 1 Then the kings and the princes of all the cities and provinces, of Syria, Mesopotamia, and Syria Sobal, and Libya, and Cilicia sent their ambassadors, who coming to Holofernes, said: 2 Let thy indignation towards us cease: for it is better for us to live and serve Nabuchodonosor the great king, and be subject to thee, than to die and to perish, or suffer the miseries of slavery. 3 All our cities and our possessions, all mountains and hills, and fields, and herds of oxen, and flocks of sheep, and goats, and horses, and camels, and all our goods, and families are in thy sight: 4 Let all we have be subject to thy law. 5 Both we and our children are thy servants. 6 Come to us a peaceable lord, and use our service as it shall please thee. 7 Then he came down from the mountains with horsemen, in great power, and made himself master of every city, and all the inhabitants of the land. 8 And from all the cities he took auxiliaries valiant men, and chosen for war. 9 And so great a fear lay upon all those provinces, that the inhabitants of all the cities, both princes and nobles, as well as the people, went out to meet him at his coming. 10 And received him with garlands, and lights, and dances, and timbrels, and flutes. 11 And though they did these things, they could not for all that mitigate the fierceness of his heart: 12 For he both destroyed their cities and cut down their groves. 13 For Nabuchodonosor the king had commanded him to destroy all the gods of the earth, that he only might be called God by those nations which could be brought under him by the power of Holofernes. 14 And when he had passed through all Syria Sobal, and all Apamea, and all Mesopotamia, he came to the Idumeans into the land of Gabaa, 15 And he took possession of their cities, and stayed there for thirty days, in which days he commanded all the troops of his army to be united. 1 Then the children of Israel, who dwelt in the land of Juda, hearing these things, were exceedingly afraid of him. 2 Dread and horror seized upon their minds, lest he should do the same to Jerusalem and to the temple of the Lord, that he had done to other cities and their temples. 3 And they sent into all Samaria round about, as far as Jericho, and seized upon all the tops of the mountains: 4 And they compassed their towns with walls, and gathered together corn for provision for war. 5 And Eliachim the priest wrote to all that were over against Esdrelon, which faceth the great plain near Dothain, and to all by whom there might be a passage of way, 6 that they should take possession of the ascents of the mountains, by which there might be any way to Jerusalem, and should keep watch where the way was narrow between the mountains. 7 And the children of Israel did as the priest of the Lord Eliachim had appointed them, 8 And all the people cried to the Lord with great earnestness, and they humbled their souls in fastings, and prayers, both they and their wives. 9 And the priests put on haircloths, and they caused the little children to lie prostrate before the temple of the Lord, and the altar of the Lord they covered with haircloth. 10 And they cried to the Lord the God of Israel with one accord, that their children might not be made a prey, and their wives carried off, and their cities destroyed, and their holy things profaned, and that they might not be made a reproach to the Gentiles. 11 Then Eliachim the high priest of the Lord went about all Israel and spoke to them, 12 Saying: Know ye that the Lord will hear your prayers, if you continue with perseverance in fastings and prayers in the sight of the Lord. 13 Remember Moses the servant of the Lord, who overcame Amalec that trusted in his own strength, and in his power, and in his army, and in his shields, and in his chariots, and in his horsemen, not by fighting with the sword, but by holy prayers: 14 So shall all the enemies of Israel be, if you persevere in this work which you have begun. 15 So they being moved by this exhortation of his, prayed to the Lord, and continued in the sight of the Lord. 16 So that even they who offered the holocausts to the Lord, offered the sacrifices to the Lord girded with haircloths, and with ashes upon their head. 17 And they all begged of God with all their heart, that he would visit his people Israel.